A highly sophisticated war machine built to infiltrate and assassinate high priority targets to bring a swift end to conflicts to reduce casualties and attrition. This model has been specifically designed to target The Marching Flame Cloaked in the same iconic red to allow the droid to easily slip within the ranks of the red army, meeting minimal resistance as it heads towards its intended targets. Staying in passive mode to preserve its concealment. This droid is specifically equipped and programmed to seek out and destroy the Theurgy Warden and the Warmonger. Once the targets have been detected, the droids main programming subroutines activate, allowing it to work at full power. Equipping this trap during Wave 4 of the War Path gives you a massive power bonus! 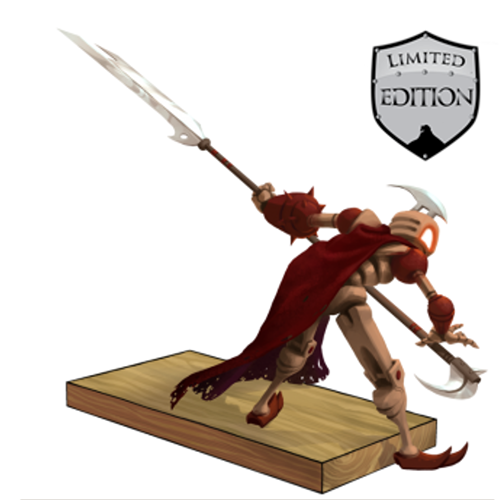 The Warden Slayer Trap is a limited edition weapon not sold by any Trapsmith. It may only be obtained from opening a Season 3 Treasure Chest. +2,500 power and +2,500% power bonus during Wave Four. 23 June 2015: The Warden Slayer Trap was introduced with the release of Season 3 Treasure Maps.